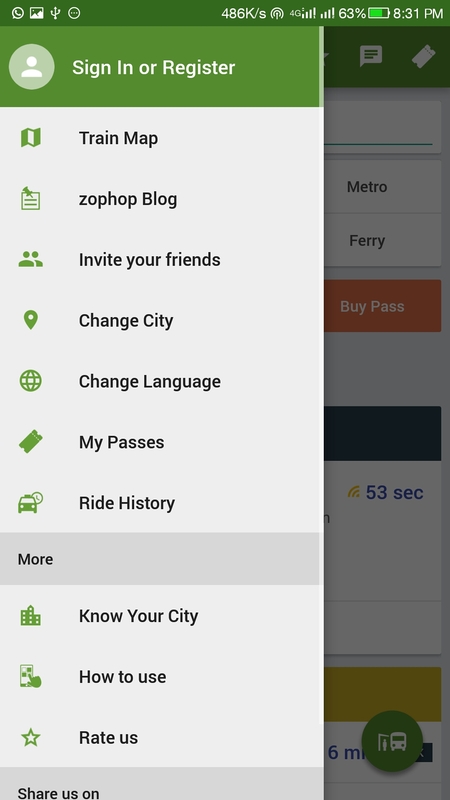 Zophop is the App which simplifies your travel decisions. Just enter the destination you want to reach and the App will do its magic and will suggest you some best ways to reach there along with cheap fares. The app has great features in it and unlike other apps, it does have live tracking for bus facility which shows the current running status of the bus. The App is having a well-designed interface and it is easy to use. On the first run, the app shows some quick tips which would make the user comfortable using the app. The App pretty neat interface. On the first run, it asks for the City for which you would like the app for. The main screen of the app shows the Search bar for Tracking down the buses with the GPS on the bus installed. This feature has however limited some buses and you cannot track down each and every bus. But for some bus, it is a really great tool as it lets you know when a bus would arrive at your stop or when you can expect the bus to reach the destination. The App is an overall green theme which is somehow resembling a ready to go anywhere. Zophop has simplified the option which clearly states why are they present and their function they perform. The Uber and Ola Cab booking tab are present on the main screen which makes the cab booking easy and you don’t have to install the separate application to use the Ola and Uber service. The train timetable and route tab shows the trains arrive and departure and route by which they would going. 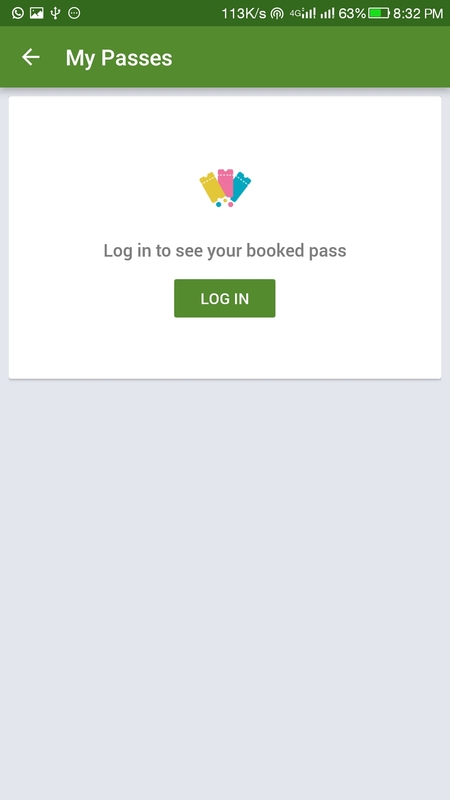 The application has good features which definitely makes it a must have app.The application has the ability to book a digital ticket for KDMT buses only. The Bus ticket booking facility is only for KDMT buses for now. You can Plan your travel from Point A to Point B. The app will automatically suggest you a best possible route along with the Cheap fare option. Also, you get the alternate option to get to your destination with the time required to reach there. One of the Best thing which I liked in the app is the push notifications it sends for the Mumbai Locals. 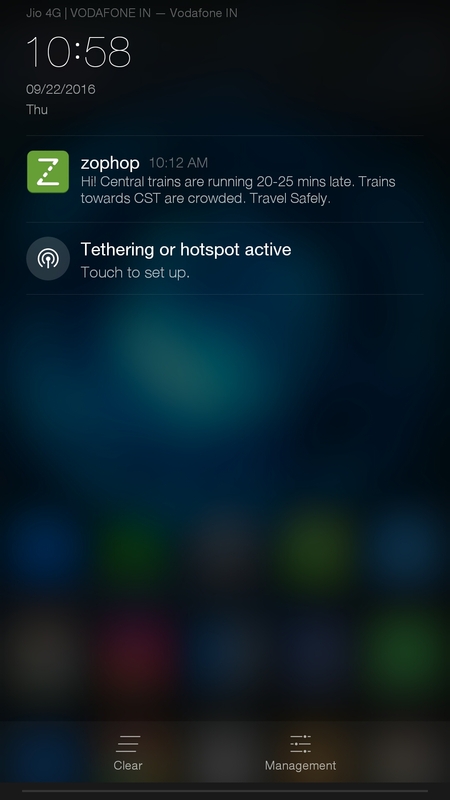 The App sends notification if trains are running slow or there is some problem in the running of the trains. 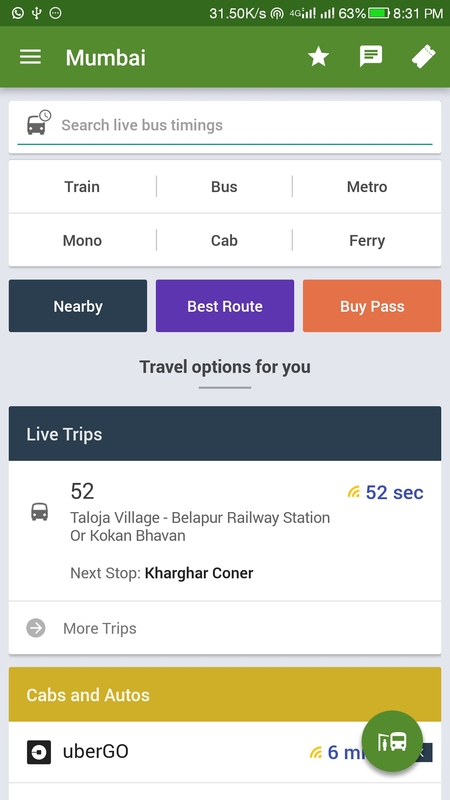 The app alerts the user to plan accordingly if there are any problem in the local trains.Based on the GPS location the app shows nearby bus stops and Railway station. The App has a Check-in feature which does it works pretty well when you use the check-in feature the app shows the nearby stops and live updates. 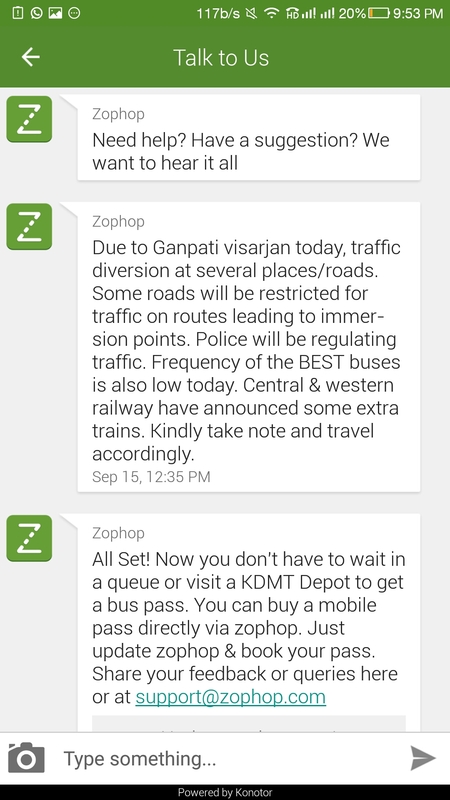 Zophop event lets you know the Monorail and Metro Timings and Schedules. The best thing about the App is that it has all the Data offline so when you aren’t connected to the internet you would still be able to check the timetable and schedules of trains,buses.If this is not enough then the App does have a Take me somewhere option where the app suggests you some quick route between two places. The apps save a lot of time on traveling on different route especially in Mumbai where you have to decide prior to leaving for the place. The App performs and does suggest you the options quickly based on the best route available. 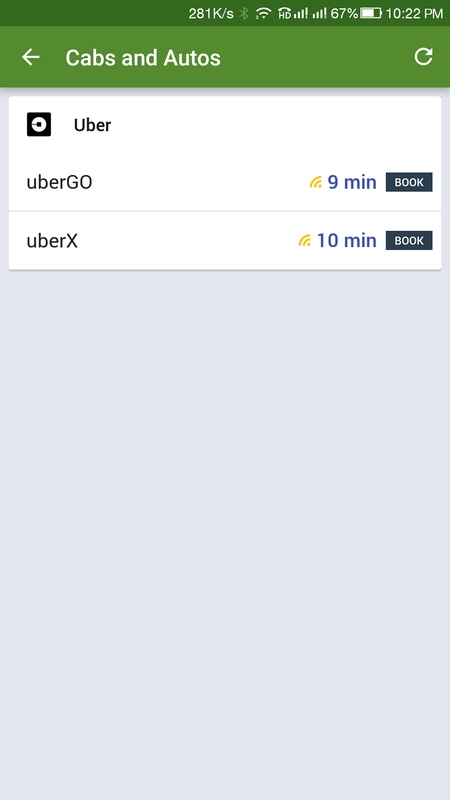 Zophop shows the availability of the cabs nearby in real time. The Booking history can be accessed from the side menu. The app allows you to change the city and there are plenty of cities for which app can be handy for traveling there. Also, the app has built-in ability to be used in Hindi and Marathi along with English which would make it easier to access in case a person is not comfortable with English. The app has to Talk to us section which I feel is very handy in case you need with something in the app or updates on the traffic status. The talk to us section provides updates on the train status if they are on time or delayed due to some reason. Also, you can report the issue if you have faced any while using the app so that dev team can rectify it. The Zophop is great for travel assistance and comes in really handy when you are a regular traveler for local trains as it provides updates on the status of the train. The bus tracking feature is really great but then not all buses can be tracked. 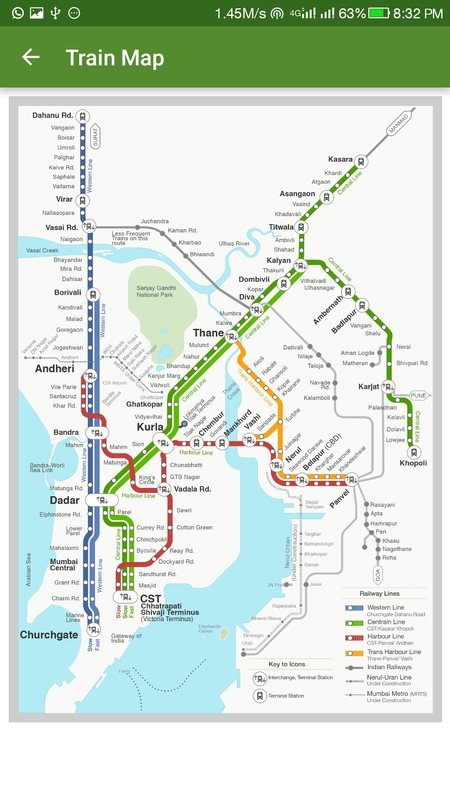 The M-Ticket feature is restricted to the KDMT bus service and Not to State Transport, Best, and NMMT – Which are the major carriers in Mumbai region. Traffic updates via Talk to us section is sometimes delayed and may not be relevant at times.The App does save you a lot of time and won’t disappoint you.